I’m a liberal and a former Democrat who regularly watches Tucker Carlson’s weeknight show on Fox. I began watching him out of desperation about two years ago, fed up and aghast at the bias and dishonesty (and stupidity) I was seeing on CNN and MSNBC. To my surprise, I began liking his show. He raised many issues with intelligence, sarcasm, irreverence, and wit, so I kept going back for more. Over the past two years, I’ve learned many things from watching his show that I wouldn’t have if I’d just watched CNN and MSNBC. Carlson raises questions on uncontrolled mass immigration and its effects on our native-born population—on how looking the other way when tens of thousands of low-skilled illegal immigrants come across the border affects the employment, wages, and psychological health of millions of native-born white, black, and Hispanic working-class Americans, and affects the public schools and social services in their communities. He highlighted why the governing and media elite can afford to push illegal immigration on the masses: with their gated communities and private schools, they shield themselves from its harmful effects. Did these views make him a white nationalist and white supremacist, as his critics allege? I don’t think so. It seems like he was pushing for the government to think about its foremost duty—to act first for the welfare of its own citizens (the majority of whom currently happen to be white). Another topic Carlson relentlessly shines a light on is Big Tech: on its monopoly power, on privacy concerns, on its misuse of personal data, on how it pushes products that could be harmful to young children over time. As 2017 and 2018 went by, I couldn’t help but appreciate how, along with Sean Hannity and Laura Ingraham on Fox, he regularly talked about things you can’t find on CNN and MSNBC: the abuses of power that occurred at the FBI and the Department of Justice with the Russia investigation. And he was the one incessant TV voice questioning the push for more military involvement in Syria in early 2017. I remember especially appreciating the times he brought on retired Col. Douglas Macgregor to talk critically about our seemingly ever-present need for new foreign military entanglements. Then there is Carlson’s focus on informing viewers about the excesses of the far left: the danger to free speech on college campuses, out of control identity politics, and the social media mob mentality that polices speech and thought (especially of conservatives), and seeks to demonize and punish those who dissent. I don’t agree with some things he says on his show, but then again, I don’t agree with some things any talk show host or commentator says. When I read his book, “Ship of Fools” I was even more impressed. As a critique of our ruling class and media elite, it was spot on, and informed me exactly why Donald Trump is now president. But it also tied with Carlson’s somewhat unlikely new role: a conservative populist who empathizes with ordinary working and middle-class Americans who’ve been buffeted by global capitalism, uncontrolled immigration, increased automation, and sudden, huge cultural change. 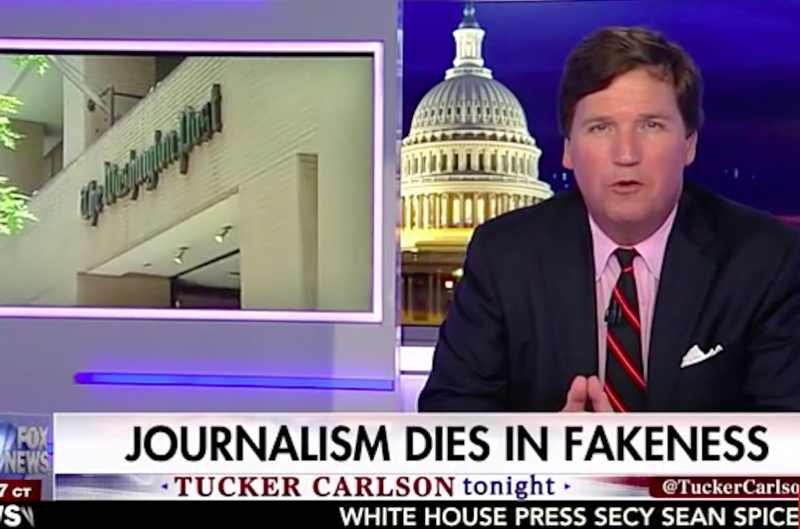 “Tucker Carlson Tonight” has lately been in jeopardy. With Media Matters publishing his offensive comments on a shock jock show from a decade ago, many advertisers are bailing on him. I think we know what’s going on—this is all about squashing dissenting political voices in a sea of left-leaning conformity. Carlson raises hard-hitting questions to his large audience every weeknight that make the governing and media elite uncomfortable and challenge their preconceived narratives. So they’ve been gunning for his show to crash and burn for some time. I’m probably among many in the silent majority who think he is an important voice whose show must go on simply because he is one of the few commentators who are voicing concerns of ordinary voters. His views on immigration may sometimes be over the top, but they are closer to my views and to those of a plurality of Americans than the Democratic Party’s. I’m an assimilated immigrant who doesn’t buy the establishment narrative on illegal immigration at all. Theirs is a cynical push for cheap labor and new voters. Why Is Free Thought Being Stifled? Tucker also shines a continual light on something that worries even many liberals: the left’s increasing tendency to stifle free speech and free thought, enforce groupthink, and demonize those who think differently. There is a reason liberals like Glenn Greenwald, Alan Dershowitz, and Dave Rubin regularly come on his show: It’s because their apostate views aren’t welcome on CNN and MSNBC. Two, this political moment is too important for us to jettison the few truth-tellers and commentators who are still tethered to reality. As a female, brown immigrant, I’m most concerned about the increasing dearth of ideological diversity and the push to crush or banish conservative voices from our public discourse. Fox News’s nightly opinion lineup of Carlson, Hannity, and Ingraham is far from perfect, but they provide an important counterpoint to the many media outlets (CNN, MSNBC, ABC, NBC, CBS) that unabashedly forward the Democrats’ talking points. CNN calling Fox News “state TV” and “a propaganda outlet” is like an Advil ad calling Aleve inefficient: it’s just advertising. Not to mention that CNN is not far from propaganda itself. Also, let’s talk about the different standards toward different opinion journalists. MSNBC’s Joy Reid said offensive things years ago, but she stays on TV. Carlson did the same, but he has to go? Millions of Democrats have gradually been conditioned to think that “the truth” can only be found on CNN and MSNBC and to see Fox as right-wing propaganda. Getting out of one’s media bubble is especially important today. You live in an alternative reality otherwise, and don’t even know it. To Democrats, I’d suggest it’s important to view other channels and outlets with an open mind. We talk about media bias, but viewer bias is bad, too. Try not to have a knee-jerk bias against conservative viewpoints. Prepare to be offended sometimes by a conservative host’s point of view. But if you stick to it you find that you have a slightly better handle on our strange, bifurcated political journalism and reality. In general, conservative journalists tend to be more charitable toward the transgressions of liberal journalists: they argue, maybe with a self-preserving instinct, that one can disagree vehemently with what someone says on TV, but we shouldn’t advocate for his or her removal. I hope Carlson’s show continues. The issues and questions he continues to ask nightly with his trademark sarcasm and irreverence are especially necessary in these times.